Joint venture ENGIE Fabricom-Tractebel and Smulders participate in the construction of one of the most important offshore wind farms in the North Sea. 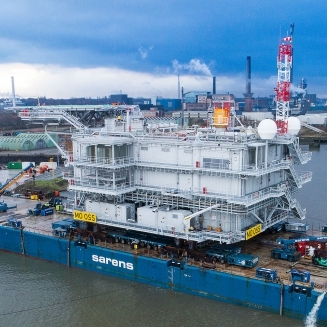 In the framework of Merkur Offshore, one of the largest wind farms (396 MW) in the North Sea representing a major step in Germany’s Energy Transition, the joint venture ENGIE Fabricom-Tractebel and Iemants has been awarded the contract for the engineering, procurement, construction, testing and commissioning of the offshore substation and associated jacket. Smulders is responsible for the basic and detailed engineering, procurement, fabrication and corrosion protection of the steel constructions for the topside and the jacket. The construction of the wind farm will be under a dual contract structure with GE and GeoSea, DEME’s specialist in complex offshore marine structures.